And we might have the photos to prove it. Earlier in September, a Russian Air Force Mikoyan MiG-31 Foxhound interceptor was spotted at the Gromov Flight Research Institute at the Zhukovsky airfield near the town of Ramenskoye, 40km southeast of Moscow, armed with what appears to be an anti-satellite weapon slung under its belly. The MiG-31, which has the “Bort” number 81 Blue, was photographed by a civilian aircraft spotter, both on the ground and in the air using a telephoto lens. However, according to sources, the photos drew the ire of the Russian Ministry of Defense, which was not happy that the images made it onto the Internet. Most of the photos were removed at press time. 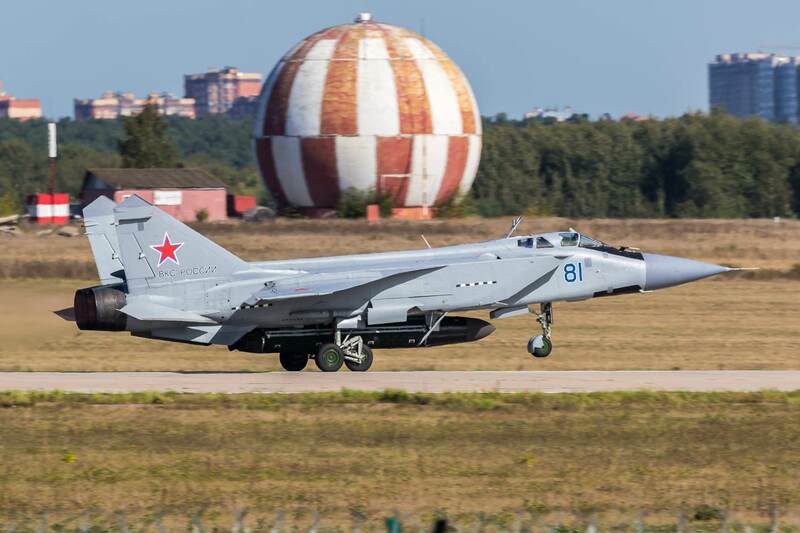 While this is the first time the modified MiG-31 has been spotted out in the open, the program to fit an anti-satellite weapon onto the Foxhound is not new. The project, according to researchers at the Russian think-tank Centre for the Analysis of Strategies and Technologies (CAST), originated with a Soviet anti-space defense program called 30P6 Contact. Among the components of the Contact program was a modified MiG-31D version of the Foxhound, the 79M6 anti-satellite missile and the 45Zh6 Krona space-tracking radar. Additionally, during the same time period, the Soviet Union worked on a modified version of the 79M6 missile that might have called the 95M6. Not much more is known about the Russian efforts to revive their anti-satellite missile program. However, the MiG-31 is an ideal platform to launch such a missile given its sheer speed, altitude and payload capability. The Foxhound is capable of reaching a temperature limited maximum speed of Mach 2.83 at an altitude of more than 67,000ft. The MiG-31 can also sustain speeds of over Mach 2.35 while carrying a full payload of air-to-air missiles. It is because of these characteristics that the Russian Air Force has adapted the MiG-31 to carry the Kh-47M2 Kinzhal aero-ballistic missile, which appears to be roughly comparable in size—or possibly slightly smaller—to this new anti-satellite missile. Indeed, while the MiG-31 has not proven to be an export success in the same way the Sukhoi Su-27 Flanker and its many derivatives have been in the years since the collapse of the Soviet Union, the Foxhound is proving itself to be a versatile and flexible aircraft for the Russian Air Force. The MiG-31—with its powerful sensor suite, enormous range and payload combined with its sheer speed and altitude—has proven invaluable for defending Russia’s vast frontiers. But forced to think outside box against a range of new threats such as missile defenses and America’s unquestioned mastery of space, Russian defense planners have found new uses for what many had written off as an obsolete design. The Foxhound will likely be serving the Russian Federation for decades to come.